Surprise your family and friends with this delicious strawberry mousse with new chocolate that is debated if it is chocolate or not, but white chocolate it is. It has a smooth, creamy consistency and a crunchy base. White chocolate recipes are more rare than normal chocolate recipes. However white chocolate consists of no cocoa at all, which makes is much more sweet. Almost like vanilla taste sort of. It provides a lot of calcium, which is beneficial for bone care because it prevents osteoporosis and other bone conditions makes chocolate healthy. Bright energy for the calories it contains so it helps athletes and people with high energy expenditure. It has aphrodisiac properties white chocolate like black. The white chocolate has fats but good so if consumed in adequate amounts will not harm health. Above you see lovely chocolate art! It is also widely used in confectionery and confectionery for the production of sweet products because of its special flavor of cocoa butter and sweetness that the chocolate gives. You can eat white chocolate measured to take advantage of its nutritional benefits. Crush Granola Kellogg’s® Ancestral Grains; Amaranth, flaxseed and cranberry in the processor and add the melted coconut oil. Mix until it is a sandy but wet consistency. Pass the base to a cake mold and with the help of a spoon press the mixture in the bottom until it is smooth. Refrigerate for 30 minutes. Mix the white chocolate with 150 g of cream to beat and put it in a water bath so that the chocolate melts. Hydrate 1/2 teaspoon of grenetine in 2 tablespoons of cold water and melt in the microwave. Add it to the melted chocolate. Let cool completely. Beat the remaining 200 g until firm peaks form and add the white chocolate mixture little by little. Incorporate it in an enveloping way. Pour the chocolate mousse into the mold with the base and return to the refrigerator for 20 minutes until it is lightly curdled. Chop the strawberries into small pieces and place them in a pot with the sugar over medium heat. Cook until the sugar dissolves and pass the preparation to the blender to form a puree with liquid consistency. Hydrate 1/2 teaspoon of grenetine in 2 tablespoons of cold water and place it in a pot over medium heat until it melts and pour it into the strawberry puree. Allow to cool to room temperature. Beat 200g of cream to beat until firm peaks and add the strawberry puree. 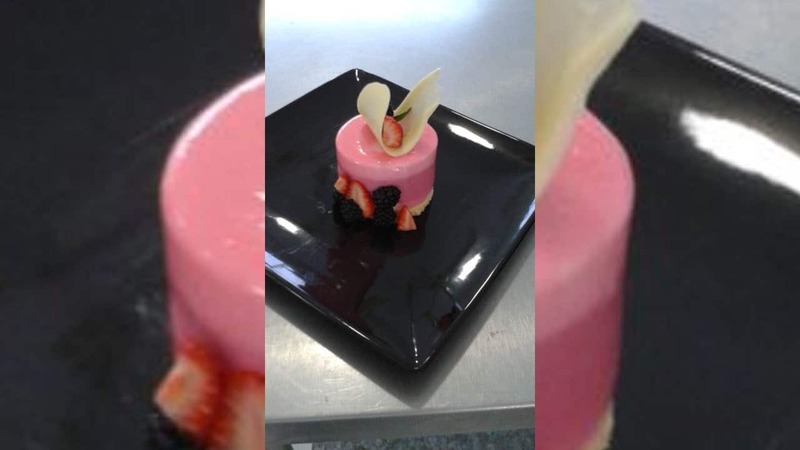 Pour the strawberry mousse into the mold and refrigerate for 4 hours until completely set. 13. Decorate with some cut strawberries and mint. Chop the strawberries into slices and place them on top of the mousse and garnish with some mint leaves. What to eat to reverse graying hair?